For anyone who’s still in Dubai, you’ve probably noticed that it’s a little quiet at the moment. Well, if you’ve been wondering where everyone has disappeared to, wonder no more, for I have found them. They are at The Atlantis. All of them. 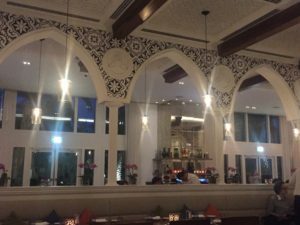 The Serb, seemingly on a mission this summer to pick every tourist trap restaurant for us to visit, made a reservation at Ayamna, the Lebanese restaurant at The Atlantis. 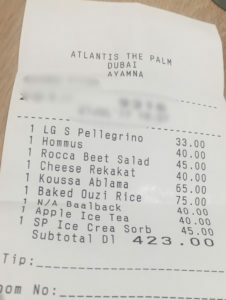 Just to put the sheer scale of The Atlantis operation into perspective, Ayamna was choice number seven on the automated reservation list – in the fine dining section. There were two other restaurant sections as well. “They said there was a belly dancer and a man and woman show at 8 pm,” the Serb informed me. I asked her what a man and woman show was. “Don’t know, they didn’t say.” She thought about it for a while. “I hope it’s not an X-man show,” she said. Lebanese cuisine is what I refer to as a legacy cuisine. A legacy cuisine is any cuisine where someone is likely to have their own personal preference and will vehemently defend their “version” of that cuisine or dish. Lebanese restaurants are the worst for this. If you ever tell someone you ate at a particular Lebanese restaurant, there is bound to be a swift and furious rebuttal from someone in the group and instructions to visit “their” Lebanese restaurant instead. To get to Ayamna on time for your reservation, just follow the same timing as you would for catching an international flight. The process is roughly the same. Throngs of people, reservation number security control, a twenty-minute hike to the gate and you are there. 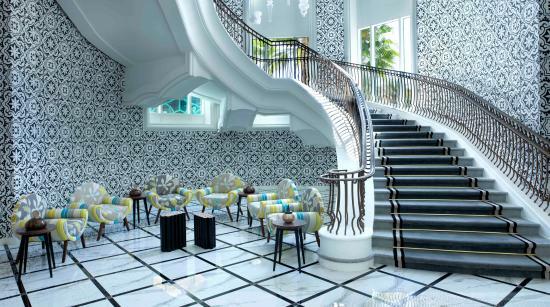 However, once you arrive, you float down a grand staircase, as if you are arriving at a regal ball. The room is spacious, with wonderfully high ceilings. There are muted blue Iznik style tiles on one of the walls, and the whole space is clean, white and crisp. Marble floors, marble tables, high mashrabiyya patterned ceilings and Arabian arches. It’s a pretty room, but for me lacked a little personality. The acoustics were poor, and it missed some character, which is one of the most important tenants of Lebanese dining. We took our seats and in true Lebanese fashion, were approached almost immediately by our charming server. Lebanese restaurants usually have efficient service, and I’m going to go on record to say that their service teams are probably the most cohesive teams going. There is a flow and grace to their chaos. Heavily laden trays full of delicious mezze are dispatched with ruthless efficiency to tables. Waiters and runners descend onto tables, create space, move items, fuss and faff, and within seconds a once empty table is full of assorted mezze, bread, and drinks. Many Lebanese restaurant teams have gone on to have successful careers as pit stop men in the F1. Probably. Our usual Lebanese order is a mixed grill, fattoush, hommous with meat and grilled halloumi. However, that’s like the most boring order ever. That’s like going to a Thai restaurant and ordering spring rolls and pad thai. Or going to an Italian restaurant and ordering chicken alfredo. So the Serb and I agreed to order something different this time. The Serb immediately asked for the hommous. We also went with the Rocca beet salad, cheese rekakat, koussa ablama and baked ouzi rice. You always can tell the quality of hummus by how a restaurant spells it on the menu. Ayamna goes for the long, regal version – Hommous, with a capital H, thank you very much. The more letters the better the hummos is. That’s what I’ve always found. I once ate a homus that was spelt homos. It was, needless to say, quite terrible. However, Ayamna’s hommous was quite the opposite thanks to their spelling. It had an exquisite creamy texture, with a great balance of tahini sharpness. It was one of the better versions I have tasted in Dubai, maybe even better than the Lighthouse. 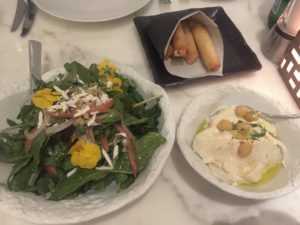 Their Rocca beet salad was fresh and with good quality ingredients. The cheese rekakat were cooked well – golden and crispy but not too oily. The saltiness of the akawi balanced nicely with the mozzarella. Our koussa ablama was exceptional. Baby marrow stuffed with dense, silky, minced lamb, served with a yogurt sauce. 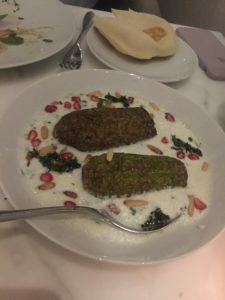 The flavour profile was bang on – lamb can be quite heavy, but Ayamna’s was light, flavourful, juicy, full of umami and balanced perfectly by the soft yogurt, mint, and coriander. My only disappointment was the marrows were baby. I could have eaten a fully grown stuffed marrow and not even felt bad about it. The baked ouzi rice needed table side service – a small football-shaped rice filled puff pastry was cut open in front of us, like some mini autopsy. Thanks to the pastry case, the rice was moist and fluffy with soft raisins, pistachio and mint dotted throughout. However, it was a very mild dish – the chicken and lamb not bringing as much flavour as I thought they should have. Also, the rice was a little cold in the center – it needed a few more minutes in the oven. The restaurant was pretty full throughout out meal – lots of tourists, but you know what – it was a pretty good experience. The food was light, lively and cooked with confidence. The restaurant is pretty, but struggles a little with the atmosphere. The staff were gracious hosts like most people from the Levant usually are. The man and woman show turned out to be a belly dancer and a singer. Just to clarify, the belly dancer was the woman, and the singer was the man. I won’t review their performance – this is not the X-factor. I would recommend this restaurant, but it’s is unlikely to be as good as “your” Lebanese restaurant!